California. Texas. The nation's two most populous states are iconic places that loom far larger than life. 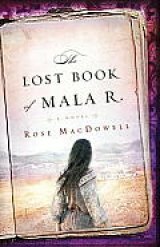 Both play important roles in Rose MacDowell's "The Lost Book of Mala R." (Bantam Books Trade Paperback Original novel, 384 pages, $15.00). The "Mala R." of the title is Mala Rinehart, exiled at 19 years of age from her Romany (Gypsy) encampment in west Texas in 1948 for a variety of seemingly petty "offenses" -- including talking back to her father and refusing to marry. She makes her way to Bakersfield, CA, where she's taken in by Ruth Simon, a family friend. Flash forward to the present day to Golden Hills Estates, a once upscale Southern California development, now shaken by foreclosures resulting from the financial meltdown and the toxic combination of greed and stupidity on the part of lenders and buyers alike, which has made California the state with the largest number of foreclosures -- second only to Nevada with the highest percentage. Three women in the subdivision -- Linda, Audrey and Christine -- are drawn to the spirit of Mala when her notebook filled with Romany spells and chants turns up at a yard sale. Audrey wants to find out what happened to the 20-year-old woman who was forced to leave her father and friends to become a stranger in a strange land -- and I can attest as one who has been there that Bakersfield can indeed be a strange land! Linda, Audrey, Christine all have issues with their respective husbands (no surprise here!). Linda is married to Peter, exiled from his financial industry job in New York City to what he perceives is a backwater. Linda finds out what conflict is really all about when Paige, Peter's 10-year-old daughter with his former wife Margaret disappears during a visit from back East -- and Margaret comes from Connecticut to help in the search. Christine is married to Tim, a secretive, often combative real estate agent who is a person of interest in the murder of a young woman, Jennifer Guthrie, a nanny to a family in the development. After years of trying to get pregnant and several miscarriages, Christine is pregnant. While she publicly defends Tim against the murder charges, his secret life makes her wonder what he's trying to conceal. Audrey, a social worker, is married to Mark, who wants to follow his counterculture dream and feels Audrey is an impediment. Audrey is having an affair with one of her clients, a young Iraq War veteran. She's also the lead person in the attempt to find out what happened to Mala in an in-person and internet search that takes her to Bakersfield and San Antonio, Texas. All this sounds like another season of "Desperate Housewives," but MacDowell makes it work. "The Lost Book of Mala R." would be an ideal book club selection. "The Lost Book of Mala R." ends with many loose ends, so I wouldn't be surprised if there's a sequel. But then again, loose ends are what defines life, so maybe this is all we'll see of these often exasperating but somehow familiar characters. I hope not. Rose MacDowell is the co-author of the 2008 novel "Turning Tables." She lives in Boston and the New Hampshire's White Mountains with her partner Paul and their two cats. Her website for "The Lost Book of Mala R." is http://www.lostbookofmalar.com.